Have you ever watched a cat clean itself? It is usually fully involved in the process, and if you watch, you can intuitively sense that the cat is living right in the moment. It isn’t thinking about what it will do later, or something that happened this morning. Watch how a cat stretches out in the sun and relaxes. This is the natural state of “being in the now” that meditators work towards. Of course animals are afraid, but they aren’t afraid and thinking “I shouldn’t be afraid.” They feel pain without the added suffering of contemplating the future of it. This “being here now” is what you see in the eyes of a deer. How can we more easily achieve this? By using an animal as a model. This takes imagination, one of the strengths of the human brain, fortunately. Watch a cat, then sit and imagine you are a cat. You’ll notice that your mind doesn’t wander into thoughts of yesterday or tomorrow. It is more at rest, yet open to whatever the moment brings. The point isn’t to think like an animal, though that can be entertaining and instructive too. The idea is to model the state of mind of an animal at peace. Combining that with your human awareness can be a powerful meditative practice. Why does this work? Our minds are more powerful than our conscious thoughts alone. Try an experiment with someone willing to play along: Tell them to act tough. Maybe they’ll flex their muscles and scowl. Then tell them to be Conan The Barbarian. The change will be more dramatic. Without needing to think about it much, their posture, expression and attitude will change. This is the power of modeling. Our subconscious minds know more than our conscious minds. When you decide to be an animal for a moment, it influences you at a deep level. Pant like a dog and run around, and you’ll feel quite different than you do now. Be a bear, sitting after he has eaten, and you’ll feel more relaxed and content. Watch a squirrel run around collecting nuts. He isn’t worried. Of course he has fear at times, but he drops it when the cause is gone. He’s just doing what needs to be done, right now, in this moment. He is at peace, even in all his busyness. 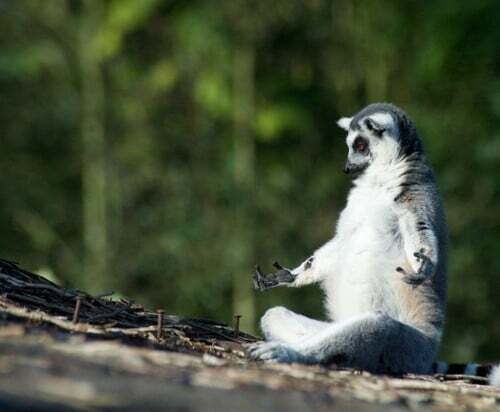 Why not bring that state of mind into your practice, and learn how to meditate from the animals?